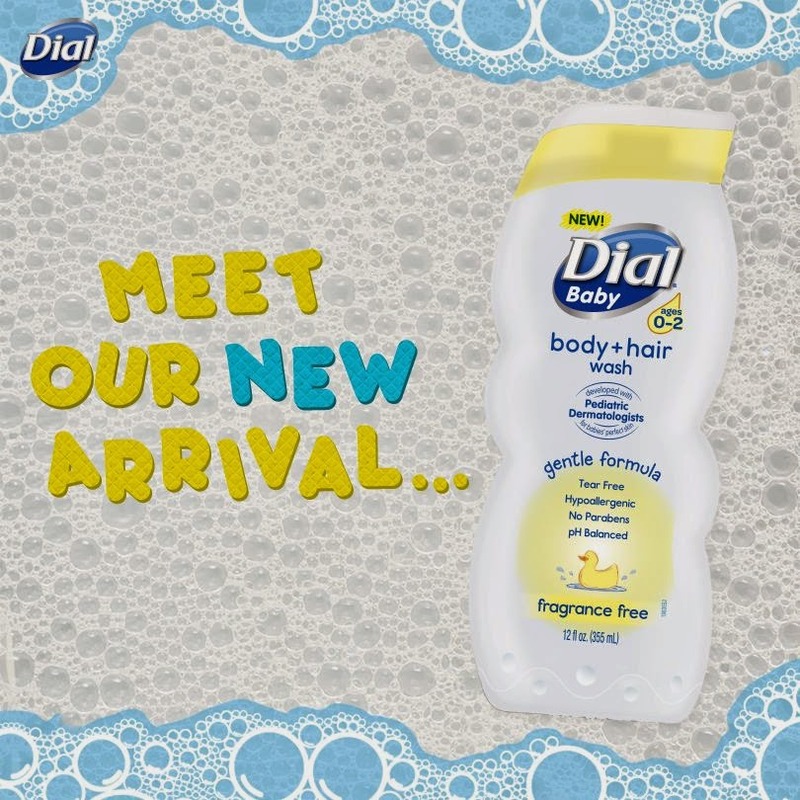 Being that I am a Dial Soap fan, I was thrilled to find out that they have some new Dial for Kids products available for mommies like me who are constantly in "clean" mode. There are two new products that have been added to the Dial family and I wanted to share with you a bit about them today. Developed with Pediatric Dermatologists, this tear-free formula is pH balanced and hypoallergenic, with no parabens or artificial dyes, for babies’ perfect skin. Gently removes environmental dirt for a head to toe clean! So, for this review I was sent a bottle of each of these new products. I am very familiar with the Dial for Kids products but haven't experienced the Dial for Baby products yet so I was very excited to try these out on my children and on my 9 month old. First of all, I will talk about the Dial Kids Foaming Hand Wash. This hand wash is fun, smells yummy and is perfect for little people. The first two days of having this hand wash in my bathroom consisted of my children finding excuses as to why they had to wash their hands. The foam was a novelty and unfortunately, was all over my bathroom at first. They LOVE it. This foaming hand wash is super easy for kids to use. Just one pump will suffice and it lathers up wonderfully. Sometimes, kids need to SEE the soap to know that they have it on their hands and this soap is perfect for that. I used it on my hands and really noticed how it felt soft and was super gentle on my skin. We don't have serious skin issues here but a few of my children have battled with Eczema in the past so I tend to err on the side of caution when it comes to hand soap for them. All three of my older children absolutely love this hand wash and I will continue to use it in the future. Next, the Dial Baby Body + Hair Wash is also very nice. It comes in an easy to handle bottle, with a tiny pour hole in the top, For those of you with babies who are sensitive to scents and harsher baby products, this is a fantastic product for you. This is a fragrance free baby product that lathers up nicely and is gentle on baby's skin. I have been noticing small patches of Eczema popping up on my baby's arms lately so I am trying to use only gentle products on her. I hate baby Eczema but am thankful that I have the option of using hypo-allergenic products on her. I love this baby body wash and will be recommending it to other moms for sure. So, my overall opinion of these new Dial products for kids is very positive. I love the options and that I can make hygiene so fun for my kids. Both of these products retail for no more than $4 and can be found at mass drug and retail stores across the country. Disclaimer: As a Purex Insider, I received no monetary compensation for this post. Dial did provide me a free sample of their products for review purposes. All quotes and stock photos are from the Dial website and email. Prizes are in coupon form and will be mailed by myself. This blog is not responsible for lost, damaged or stolen prizes and in this case, I am not responsible for replacing coupons under any circumstances. All thoughts and opinions are 100% mine. Having fun soap helps motivate my kids to wash their hands. Lead by example and make it fun. I started teaching my daughter early so now it is just a habit. Lead by example and make it fun. Sorry Cheryl that was the same thing I thought of. We used to have the rag monster come and wash the kids up to make it fun. My girls are young enough that they still think that washing their hands is fun, but i know they will soon grow out of it! I always praised my kids when they did a good job of hand washing. I taught my girls to sing a song while they washed their hands. They loved it. We always sang while washing hands. Even when we first started potty training, we did it. Now my baby is 25 and every once in a while I'll catch her coming out of the bathroom humming. It makes me smile! Make a game of it and sing a song while you wash hands. Also have some neat soap to use! Buy soap they like and demonstrate for them. Get them a Giant Microbe stuffed germ to see what germs look like. to sing the ABCs while washing their hands so they wash long enough! Being persistent helps, and singing ABC song! Doing it myself and telling them what i'm doing. My tip is to set a good example and always wash your hands too. Fun scented soaps always seem to help. Singing a song while washing helps, too. My best tip is to start early and get the in the habit of washing hands are using the restroom, after petting the dog or cat, before meals. It helps them to wash longer if you have them sing a song like their ABC's while doing it. Show them through actions and remind them often.